Welcome to cfj.com.au (the 'Website'). The Website provides you with an opportunity to browse and purchase various products that have been listed for sale through the Website (the 'Products'). The Website provides this service by way of granting you access to the content on the Website (the 'Purchase Services'). The Website is operated by Cameron’s Fine Jewellers (ABN 13 348 426 292). 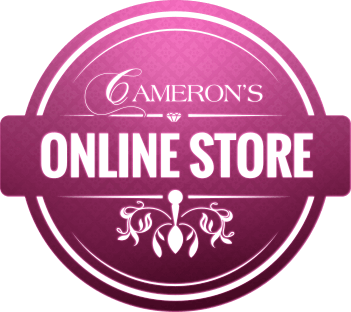 Access to and use of the Website, or any of its associated Products or Purchase Services, is provided by Cameron’s Fine Jewellers. Please read these terms and conditions (the 'Terms') carefully. By using, browsing and/or reading the Website, this signifies that you have read, understood and agree to be bound by the Terms. If you do not agree with the Terms, you must cease usage of the Website, or any of the Purchase Services, immediately. Cameron’s Fine Jewellers reserves the right to review and change any of the Terms by updating this page at its sole discretion. When Cameron’s Fine Jewellers updates the Terms, it will use reasonable endeavours to provide you with notice of updates to the Terms. Any changes to the Terms take immediate effect from the date of their publication. Before you continue, we recommend you keep a copy of the Terms for your records. You accept the Terms by remaining on the Website. You may also accept the Terms by clicking to accept or agree to the Terms where this option is made available to you by Cameron’s Fine Jewellers in the user interface. You warrant that any information you give to Cameron’s Fine Jewellers in the course of completing the registration process will always be accurate, correct and up to date. Following payment of the Purchase Price being confirmed by Cameron’s Fine Jewellers, you will be issued with a receipt to confirm that the payment has been received and Cameron’s Fine Jewellers may record your purchase details for future use. Cameron’s Fine Jewellers may, at their sole discretion, provide a refund on the return of the Products within 14 days where the Product packaging is unopened and remains in a saleable condition. You acknowledge and agree that you are liable for any postage and shipping costs associated with any refund pursuant to this clause. Cameron’s Fine Jewellers' Products come with guarantees that cannot be excluded under the Australian Consumer Law. You are entitled to a replacement or refund for a major failure of the Product. You are also entitled to have the Products repaired or replaced if the Products fail to be of acceptable quality and the failure does not amount to a major failure (the 'Warranty'). You may make a claim under this clause (the 'Warranty Claim') for material defects and workmanship in the Products within 12 months from the date of purchase (the 'Warranty Period'). In order to make a Warranty Claim during the Warranty Period, you must provide proof of purchase to Cameron’s Fine Jewellers showing the date of purchase of the Products, provide a description of the Products and the price paid for the Products by sending written notice to Cameron’s Fine Jewellers at 192 Campbell St, Swan Hill, Victoria 3585, Australia or by email at enquiries@cfj.com.au. Where the Warranty Claim is accepted then Cameron’s Fine Jewellers will, at its sole discretion, either repair or replace any defective Products or part thereof with a new or remanufactured equivalent during the Warranty Period at no charge to you for parts or labour. You acknowledge and agree that you will be solely liable for any postage or shipping costs incurred in facilitating the Warranty Claim. The Warranty shall be the sole and exclusive warranty granted by Cameron’s Fine Jewellers and shall be the sole and exclusive remedy available to you in addition to other rights and under a law in relation to the Products to which this warranty relates. The Website, the Purchase Services and all of the related products of Cameron’s Fine Jewellers are subject to copyright. The material on the Website is protected by copyright under the laws of Australia and through international treaties. Unless otherwise indicated, all rights (including copyright) in the site content and compilation of the website (including text, graphics, logos, button icons, video images, audio clips and software) (the 'Content') are owned or controlled for these purposes, and are reserved by Cameron’s Fine Jewellers or its contributors. You may not, without the prior written permission of Cameron’s Fine Jewellers and the permission of any other relevant rights owners: broadcast, republish, up-load to a third party, transmit, post, distribute, show or play in public, adapt or change in any way the Content or third party contact for any purpose. This prohibition does not extend to materials on the Website which are freely available for re-use or are in the public domain. You acknowledge that Cameron’s Fine Jewellers does not make any terms, guarantees, warranties, representations or conditions whatsoever regarding the Products other than provided for pursuant to these Terms. Cameron’s Fine Jewellers will make every effort to ensure a Product is accurately depicted on the Website, however, you acknowledge that sizes, colours and packaging may differ from what is displayed on the Website. Cameron’s Fine Jewellers we will not be liable for any special, indirect or consequential loss or damage (unless such loss or damage is reasonably foreseeable resulting from our failure to meet an applicable Consumer Guarantee), loss of profit or opportunity, or damage to goodwill arising out of or in connection with the Purchase Services or these Terms (including as a result of not being able to use the Purchase Services or the late supply of the Purchase Services), whether at common law, under contract, tort (including negligence), in equity, pursuant to statute or otherwise. Cameron’s Fine Jewellers' total liability arising out of or in connection with the Purchase Services or these Terms, however arising, including under contract, tort (including negligence), in equity, under statute or otherwise, will not exceed the most recent Purchase Price paid by you under these Terms or where you have not paid the Purchase, then the total liability of Cameron’s Fine Jewellers is the resupply of information or Purchase Services to you. You expressly understand and agree that Cameron’s Fine Jewellers, its affiliates, employees, agents, contributors, third party content providers and licensors shall not be liable to you for any direct, indirect, incidental, special consequential or exemplary damages which may be incurred by you, however caused and under any theory of liability. This shall include, but is not limited to, any loss of profit (whether incurred directly or indirectly), any loss of goodwill or business reputation and any other intangible loss. Cameron’s Fine Jewellers is not responsible or liable in any manner for any site content (including the Content and Third Party Content) posted on the Website or in connection with the Purchase Services, whether posted or caused by users of the website of Cameron’s Fine Jewellers, by third parties or by any of the Purchase Services offered by Cameron’s Fine Jewellers. The Terms will continue to apply until terminated by either you or by Cameron’s Fine Jewellers as set out below. closing your accounts for all of the Purchase Services which you use, where Cameron’s Fine Jewellers has made this option available to you. Your notice should be sent, in writing, to Cameron’s Fine Jewellers via the 'Contact' link on our homepage. the provision of the Purchase Services to you by Cameron’s Fine Jewellers is, in the opinion of Cameron’s Fine Jewellers, no longer commercially viable. Subject to local applicable laws, Cameron’s Fine Jewellers reserves the right to discontinue or cancel your membership to the Website at any time and may suspend or deny, in its sole discretion, your access to all or any portion of the Website or the Purchase Services without notice if you breach any provision of the Terms or any applicable law or if your conduct impacts Cameron’s Fine Jewellers' name or reputation or violates the rights of those of another party. When the Terms come to an end, all of the legal rights, obligations and liabilities that you and Cameron’s Fine Jewellers have benefited from, been subject to (or which have accrued over time whilst the Terms have been in force) or which are expressed to continue indefinitely, shall be unaffected by this cessation, and the provisions of this clause shall continue to apply to such rights, obligations and liabilities indefinitely. The mediation will be held in Victoria, Australia. The Purchase Services offered by Cameron’s Fine Jewellers is intended to be viewed by residents of Australia. In the event of any dispute arising out of or in relation to the Website, you agree that the exclusive venue for resolving any dispute shall be in the courts of Victoria, Australia. This website has been granted authority to display the registered Trademark (Logo) of the National Council of Jewellery Valuers (NCJV). The NCJV accepts no responsibility whatsoever for any representations, express or implied, made by this entity or business and makes no representations about the quality of the products, services, activities and/or statements appearing on this website. The NCJV does not, by authorising the display of its logo, intend to make any statements and/or representations about, or endorse any entity and/or business or other website whether directly or indirectly. The NCJV does not warrant or represent that the information on this website is free from errors or omissions or is up-to-date information.